Stanley Cup, Double No-Hitters and a Near Foul Ball | Have Game? Will Travel! Last night was the 888th regular season MLB game I have attended since 1990. And, it may have been one of the most memorable I have ever attended. The combination of the Blackhawks carrying the Stanley Cup around Wrigley Field, double no-hitters lasting for 6.5 innings for the first time since July 13, 1980 and a near foul ball made for an incredible evening. Before the game, the Chicago Blackhawks and the Stanley Cup were supposed to be a Rockit Bar & Grill. However, when we arrived at 6:30 pm the trophy was not there and the pre-game ceremony was starting in 15 minutes. 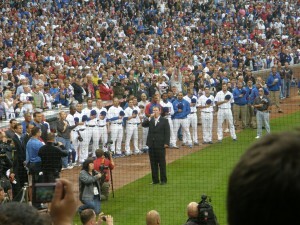 We immediately entered Wrigley Field for an amazing pre-game ceremony. First, the Blackhawks walked around the field along the warning track as Blackhawks players shook hands with Cubs and White Sox players. 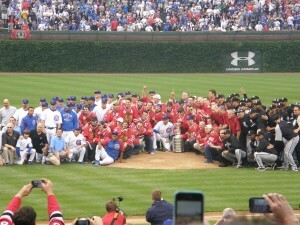 Second, Ozzie Guillen held the Cup in the air. Third, the Blackhawks lined up behind the pitcher’s mound as John McDonough (a long time Cubs executive) threw out the ceremonial first pitch. Fourth, one of the coolest things in Chicago sports happened – the Chicago Blackhawks, Chicago Cubs and Chicago White Sox all lined up for a picture. This must be the first time three Chicago teams were on the same playing surface at the same time. Next Blackhawks national anthem singer, Jim Cornelison, brought down the house with his rendition of “The Star-Spangled Banner” as the crowd cheered as though we were at the United Center before a Chicago Blackhawks game. If the celebration before the game was not enough then Gavin Floyd and Ted Lilly gave all the non-hockey fans a treat. Both pitchers threw no-hitters through 6.5 innings for the first time since July 13, 1980 in a game when the White Sox hosted the New York Yankees. Gavin Floyd lost his no-hitter with two outs in the bottom of the 7th inning as Chad Tracy singled to center. Ted Lilly lost his no-hitter with no outs in the top of the 9th inning and in a heavy rain as Juan Pierre also singled to center. Carlos Marmol had a shaky ninth inning but was able to close out the White Sox as the Cubs won 1-0 – only the 15th 1-0 game I have witnessed. He also did not give up a hit so the combined one-hitter was the sixth one-hitter I have witnessed. 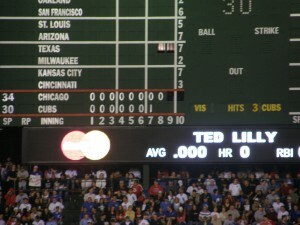 In fact, Ted Lilly was a part of the last one-hitter I saw as he took a no-hitter into the 7th inning on the Cubs home opener last season in which the Rockies also only managed one hit. To make the game even more exciting for us was the fact a foul ball bounced off of my hand as about six other hands pushed my hand out of the way. It would have been the 8th game ball I have caught during a game. After the game we heard the Stanley Cup would again be at Rockit Bar & Grill as did a few other folks. The line outside of Rockit was long but we decided to check it out anyway. As we approached the front of the line, one of my friends was there so we, of course, acted as though he was holding our spot. In order to get in we had to promise to buy food – we ordered appetizers as we learned from http://twitter.com/billydec that the Cup was not coming to the restaurant since the city of Chicago did not want the Cup to stay in Wrigleyville. 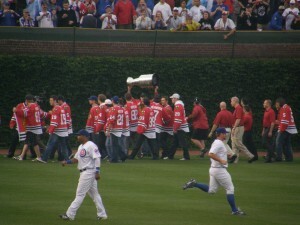 Of course, the only reason we were there was because he had said the Cup was definitely coming there all day. Good marketing plan? Definitely!